Hi all! I'm squeezing in my May monthly Pusheen manicure before we move on to June! This one is so busy and cute, that it was actually more difficult! I've been having fun with these and I'm kind of proud of myself that I've been keeping this up! HAHA. I'm back with another Fantasmic Flakies custom. These polishes are only available if you are a member of the group (head to the end of my post). Alter Ego is one of the featuring brands this month, so let's see her contribution. Today is Memorial Day, and while you may be enjoying it with the beach and a BBQ (I'm sure I'll partake in the latter), I like to remember the service of veterans and those who have fallen. I have done this manicure before, but I like to redo it every year. Every year, I buy poppies from local veterans, so if you see the "Buddy Poppy" around your town, please donate $1 and wear it proudly! I have one of my work purse year round. This month's Polish Pickup theme is Under the Sea! Alter Ego was inspired by a fellow maker's coral and the outcome is this glittery and shimmery top coat. Alter Ego is one of many makers in the Polish Pickup this month, where you get to curate your own box of exclusive polishes! Hello Thursday! How has your week been!? I spent all day at the Bronx Zoo yesterday and forgot how fun the zoo can be! It is such a large zoo though, that I missed a ton of cool animals. Next time! Anyway, I'm back with my last Beauty Big Bang nail art item, and this time, it's holo striped sequins! So this is a sort of press sample. Shannon at Pahlish gave me this at Polish Con to try out. She is supporting this local brand, which I think is awesome. I previewed it here in my Polish Con coverage, but now, I'm giving you a full review! As someone who has to take care of her nails, cuticle care is really important so I was happy to try this out. I had the new Girly Bits collection out while I was swatching them and the new Zoya collection, and noticed the colors paired really well together. As I finished swatching the GBs, I decided on a rainbow skittle manicure to be my manicure for the next few days! What better way to end your Monday than with rainbow sparkly glitter? In this world, we could use some rainbows. The new Girly Bits collection is 7 glittery, but smooth, microglitters with a special polish only available if you purchase the whole collection. 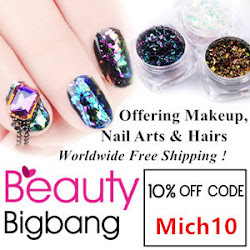 I'm back with another Beauty Big Bang product! This time, I'm playing with these shifty sequins! I was swatching the newest Morgan Taylor collection and realized Best Face Forward would make the perfect base! Good morning! The weather went from kind of chilly and 50 on Sunday to 95 yesterday and today. To say NYC is unprepared is an understatement haha. I've been playing with the summer collection from Morgan Taylor for a few weeks with my reverse stamping and my gradient dry brush nail art, so now I've got my full review of these colors. Good evening! Sorry for the late night post! I really wanted to share this duo from Girly Bits! Although a bit later this month, the May CoTM debuted a few days ago and the special pricing is through May 25th. These were inspired by Mother's Day and a big LOL to the names! I've been holding off on using this plate until I could figure out reverse stamping. It's been fairly messy and stressful but thanks to a bunch of amazing bloggers, they gave me some awesome tricks and I finally got to use this plate! 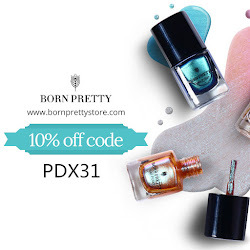 This is a newer offering from Born Pretty, and I loooove it. You need this plate! Hi All! If you're a mother, know a mother, have a mother, or just have a mother figure in your life, then Happy Mother's Day! I did some quick nail art for the mom I love, and so cheers to her! I feel like the current rage right now are these awesome holo, mulithcrome, and flake powders that people use with gel polish! Well, a new-to-me beauty store, Beauty Big Bang, reached out to me to test their products, so I decided to let's have a go with these flakes, but guess what, USE REGULAR NAIL LACQUER! Ok, let's go! I'm still playing around with the Selfie Collection. I hope to swatch them ASAP but I keep doing art with them! Haha. I actually wore All About the Pout the other day to a bridal shower and two days after, I decided to do some quick up to cover up tip wear! Hello All! It's a cheery Monday for me. This week is the last semester with my students. It's always bittersweet after working with many for a year, but then I think about next semester and the new faces I (hopefully) inspire. To start of the week, I'm all about second chances. I shared these cool Mondrian-esqu water decals a few weeks ago, and they fell apart on me. So I wanted to give the other set a try! Zoya is here with their summer collection. Like all their summer collections, this one is huge! Hi all! Unless you're living under a serious boulder, you knew Polish Con NYC happened last Saturday. While I didn't attend as press since I was working a table, my blogger side came running out and I decided to try and do a little press review! Unfortunately, many tables weren't ready. Some didn't mind and let me take candids (which I love!) and some said no and wanted me to come back, so if you see some missing, that's why. That's the nature of these events! I have a small window to run around to tables and took what I could! Some, I literally just missed :( By the end of the night, many displays were either depleted with stock or destroyed by the hundreds of attendees haha. Good evening! I just wanted to share a fun look with the leaf plate that I shared with you here. I adore the designs on this plate, so I had to do another mani! I'm back with the Alter Ego contribution to the Polish Pickup. May is based on Science! Polish Pickup debuted last month and it was awesome. 18 makers. Exclusive polishes. Buy what you want. I wore this polish for a few days, and so many people commented on it. It's so awesome. Good evening! I have a super special polish today, it's a custom for the Fantasmic Flakies group! If you love flakies, you want to join this group! They do tons of customs with flakies! And this month, Paint Box Polish has a gorgeous contribution. Plus, it's the last Paint Box before the rebranding! Eeeeee this past weekend was Polish Con NYC! As I mentioned before, I was working at the KBShimmer table, helping the brand out while crowds came for those awesome exclusives. I hope you didn't miss out on the neons! Did you see me or talk to me? Did I enable you? Do you have no idea who I am? Maybe you missed my face, but did you catch my nails?